After all, your front entrance is where you receive guests and neighbours and where you lay your welcome mat! It’s vital that a home entrance feels welcoming and has a solid foundation. The front porch is one of the most prominent features of a home’s exterior. A small landing or a large wrap-around patio, your porch is a highly visible design element that requires attention to detail. One of the lowest maintenance options for a front entrance is a concrete porch with matching concrete steps. Using the same colour and pattern for both the stairs and porch pad unifies the look and creates a seamless and elegant transition to your front door. Many property owners are moving past the look of grey brushed concrete and embracing coloured concrete. 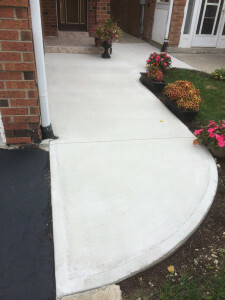 Concrete entrances add value to your property and create durable, slip-free surfaces that reduce the amount of mud dragged into your home. Many home and property owners choose interlocking pavers to create a dream front entrance that can be seen from a distance. Interlocking pavers offer unique colours, textures and sizes, giving your front entrance that ‘wow’ factor many home owners seek. We work with you to design a front entrance that will impress your guests, add curb appeal and reflect your style. Just as with a home, the front entrance to your commercial property tells a story. When it comes to a commercial establishment, your front entrance should convey professionalism and a certain style that matches your company’s brand. To find out how to transform your front entrance, click here for your free, no obligation consultation. Read our articles to find out how much it cost to install concrete or interlock front entrances and porches. 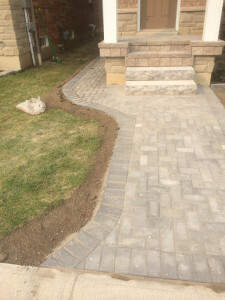 Serving commercial and residential clients since 2007, we are landscape contractors specializing in interlocking and concrete. Read our testimonials from satisfied clients in Mississauga, Milton, Brampton, Oakville and Burlington. See more of our front entrance work. Serving Mississauga, Brampton, Milton, Oakville, and Burlington. How Much Does Interlocking Pavers Cost?